← A song for worship on Earth Day. 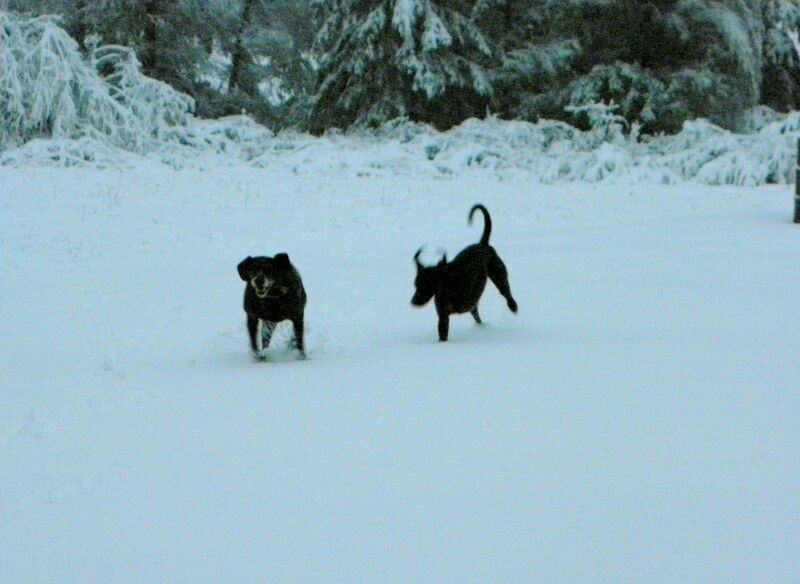 Seriously, I didn’t believe my master when he told me I would get to play in the snow today. When I went to bed last night, the grass was green. When I woke up this morning, the green was gone! I guess I should give him a bit of credit for snowing what he’s talking about! The view from our new kitchen of our first snowstorm in the new house. 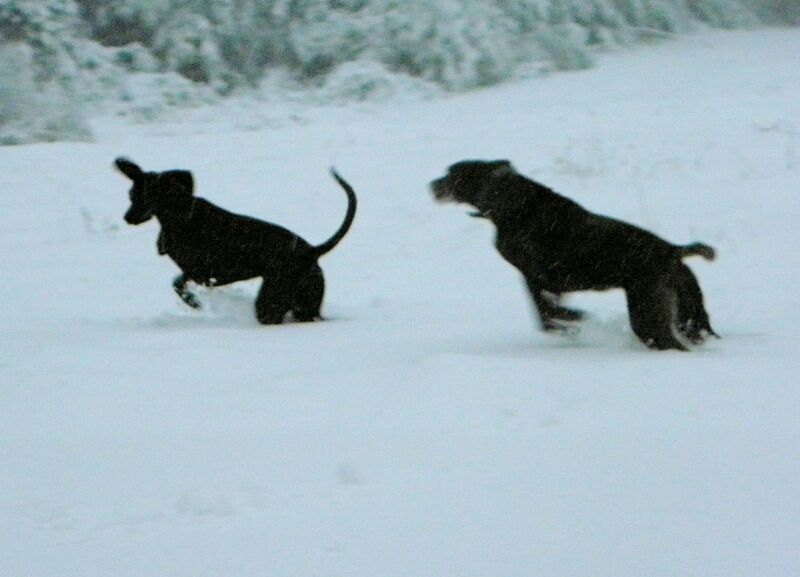 My cousin Elsa loves the snow just as much as I do! Here's a good pic of us standing still (for a moment). Gramma said I look like a demon in this pic... and then she made me a pancake for breakfast. Below is one more pic of beautiful Elsa. Here's a close-up of Elsa. 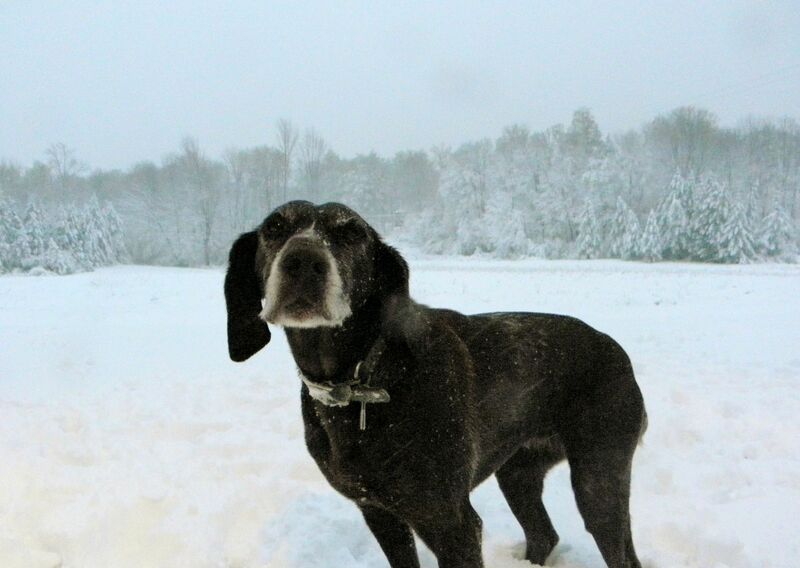 She's a German Shorthair Pointer, too. I rarely post pics of her because she's camera shy and a rather private individual. She doesn't have Internet access, so please don't tell her this pic is online or she'll be all up in my face about it. 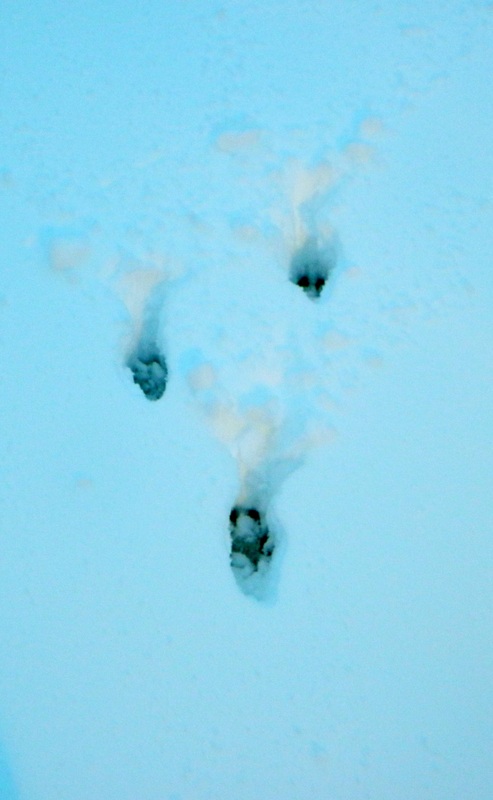 Gallery | This entry was posted in Popular Stuff and tagged 2012, 3-legged dog, animals, april 23, april snow, current, dogs, environment, event, historic snowstorms, humor, late snowstorm, life, local, nature, news, nor'easter, photography, photos, pics, snowpril, snowstorm, three legged dog, weather, winter. Bookmark the permalink. 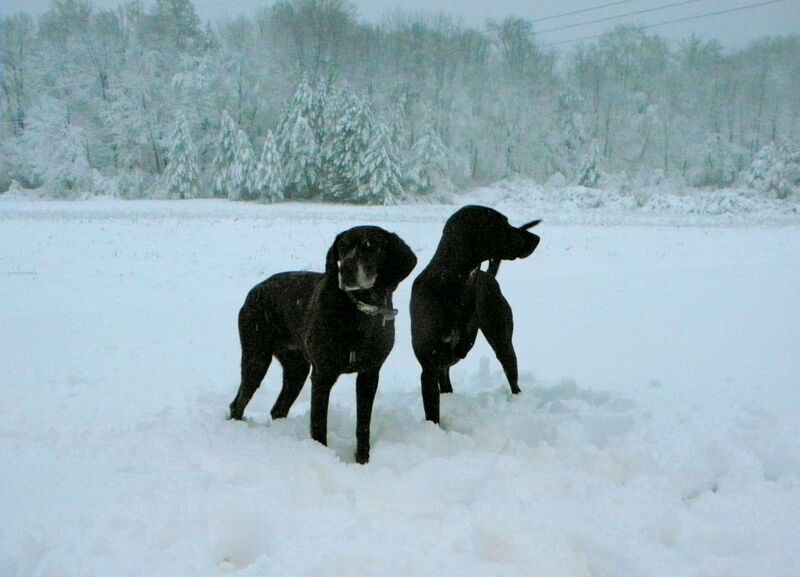 11 Responses to Do you snow what happened last night in PA? Wow, I would love some snow – it is hot here! Thank you for sharing your beautiful photos – the one looking out of the window is absolutely stunning. Love to you and everyone there…yes, you do look like a demon in that one…hmm. Thanks for posting these pictures!! It’s a beautiful late season PA snow indeed! My dogs are all thrilled. My daughter’s bus driver who spends winter in Florida is less thrilled. In my opinion, if spring can intrude on winter’s stay, then winter has every right to intrude on spring’s stay. 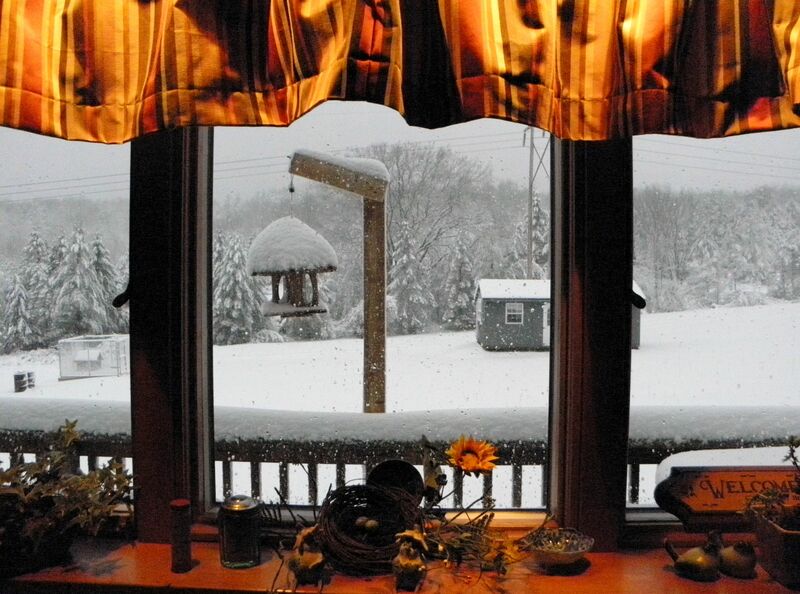 I admit, I am a bit biased toward winter, but that’s my story & I’ll tell it like I want. Yes – we watched the snow go by Maryland and my daughter can not go back to school in Frostburg because of it. She is happy an extra day at home. Great snow pics. I won’t tell Elsa. Haha! Excellent! Thanks for the note! Thanks so much for the comment, Sherry. Yes, I swim in circles as well! What I TRULY LOVE is blowing bubbles and chasing them! My master said he’s going to get me a life vest this year so that I can venture further… and in a straight line, perhaps… If you like 3-leggers, then perhaps you’d like tripawds.com, which is a Simple Press site that is dedicated to the stories of us tripawds. WOOF! Sounds like you have a good master! !